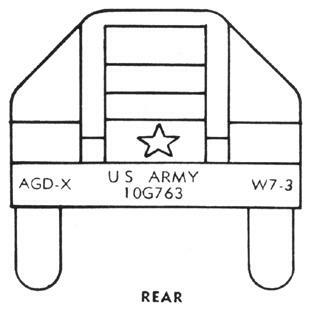 a) The identification legend "U. S. Army" will be marked on all vehicles and equipment within the scope of this bulletin unless otherwise specified. b) The legend will be applied in letters 3 inches high. 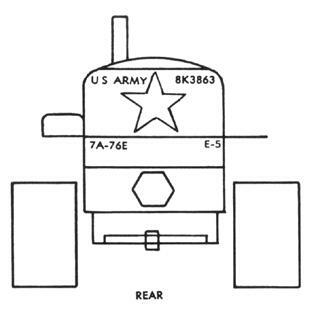 Smaller letters may be used only when the vehicle or equipment design is such that space at the marking location is limited and will not accept 3-inch size. c) This marking will be applied at the following locations. For vehicles and equipment, where design configuration does not coincide with the examples, the terminology "appropriate surfaces" is included, and is intended to complete legend location instructions. Location examples as shown in succeeding paragraphs are mandatory. 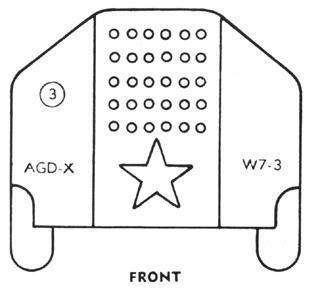 (a) At side edges of the hood, each side of the truck. 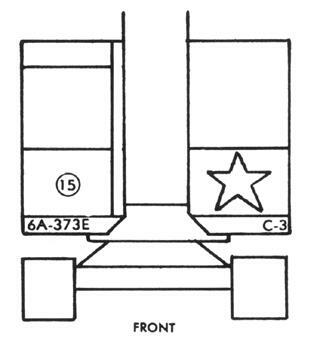 (b) Across cargo truck tailgates, across flat body rear sills, below rear cab window on truck tractors (above if required due to space limitation) across rear of van bodies or tank trucks, or another appropriate rear surface of other body types. 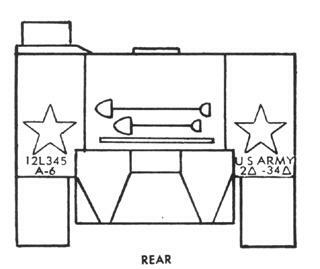 (2) Combat vehicles (figure 3). 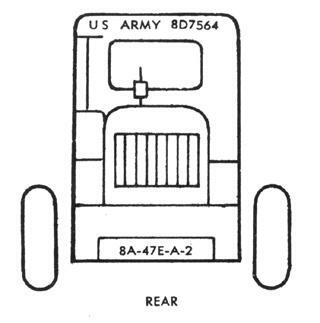 (a) On each side and on the rear of the vehicle on the most appropriate surface. (b) On hull type vehicles such as tanks, self-propelled artillery, and armoured personnel carriers, the agency identification will also be applied on an appropriate front surface. 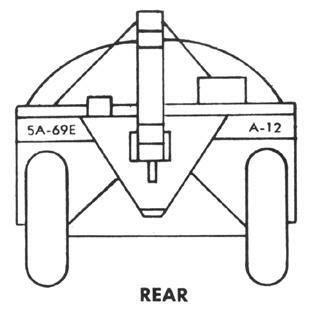 (3) Trailers, semi-trailers (figure 4). 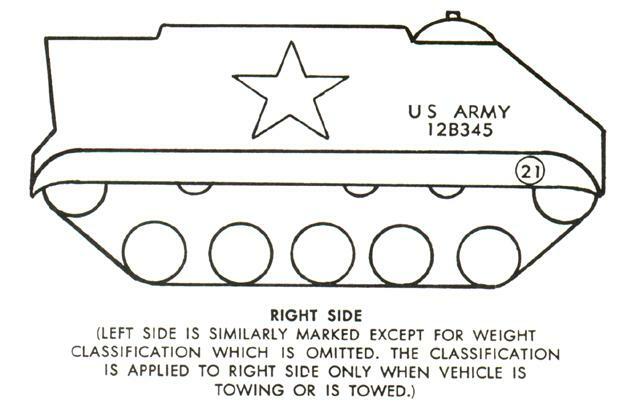 (a) Centred vertically on the front quarter section of each side of van and tank type vehicles. On the side edge of the body near the forward end of open body trailers and semi-trailers. 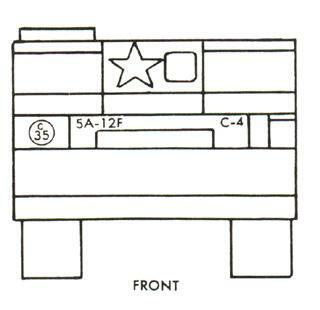 (b) Across cargo body tailgates, across flat body rear sills, across rear of van bodies, or another appropriate rear surface of other body types. 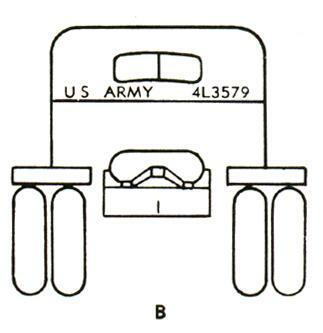 (4) Dollies, trailer converters (figure 4). 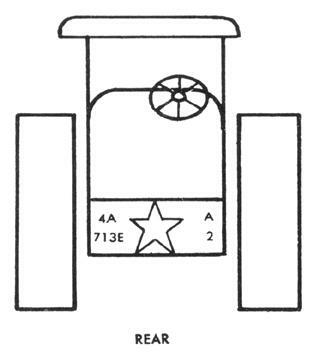 (a) On each side at the forward section of the frame or drawbar. (5) Construction and highway construction equipment (figure 5). 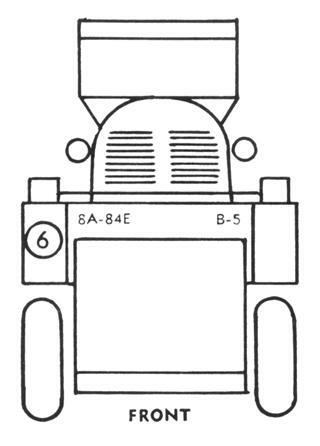 (a) On each side at edges of the hood, immediately below cab windows, on side rails, or other appropriate side surfaces of other equipment types. 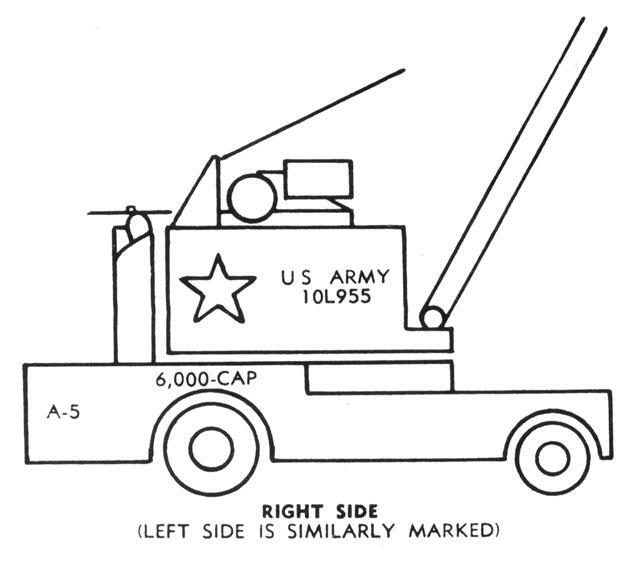 (b) Above rear cab windows, upper panel on windowless cab equipment, or other appropriate rear surfaces of other equipment types. (6) Materials handling equipment (figure 6). 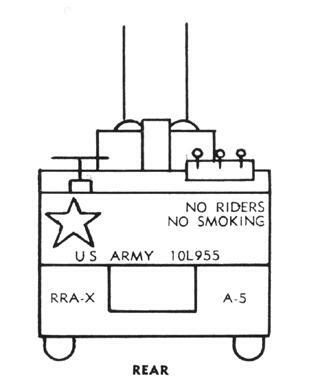 (a) On side edge of the hood (gasoline powered equipment) on each side of the battery box (battery powered equipment). 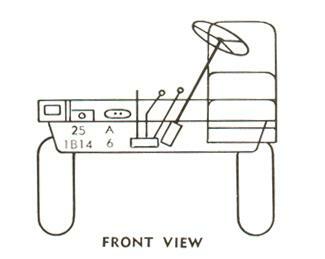 (b) Across rear sills of frame members, lower rear panels, or other appropriate rear surface. 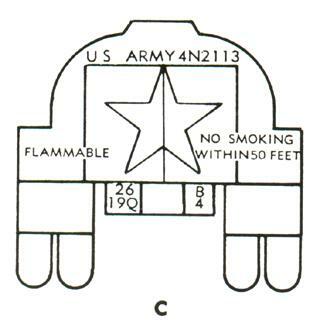 (7) Amphibious lighters (figure 7). (a) On each side forward. 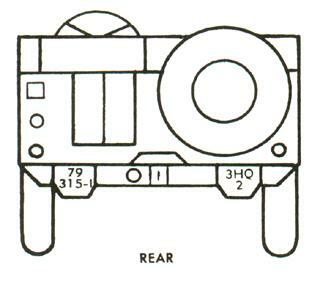 (b) On an appropriate rear surface. 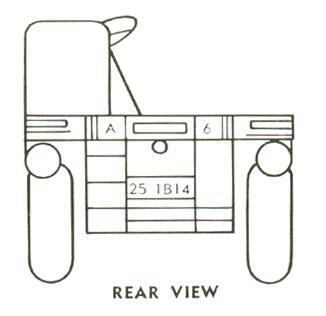 (a) Across upper part of rear fender to the rear of the driver's seat. 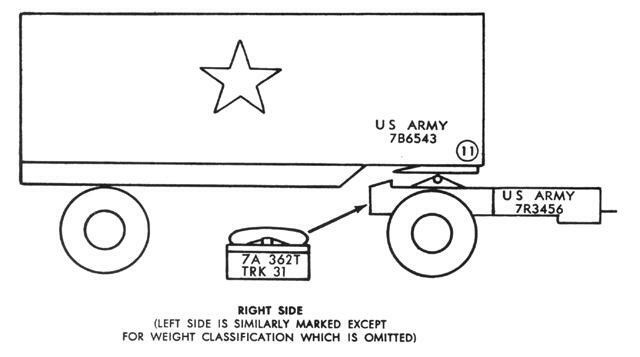 d) Vehicles or equipment not already marked per this bulletin will be marked with the identification U. S. Army on all sides when intended for photographing or public display. a) Registration numbers will be marked on all vehicles and equipment to which such numbers are assigned, as defined in AR 700-10.
b) The registration number marking will be applied immediately below the agency identification with a space of 2 inches between the two, where space permits. Normally, the registration number is applied directly below the agency identification on the sides of the vehicle or equipment. 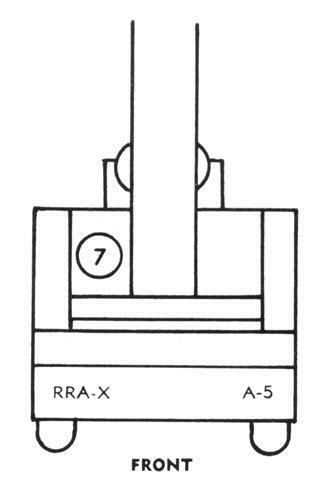 Refer to figures 2 through 8.
frame rail surfaces. Refer to figures 2 through 8.
d) The registration number marking will be applied in the same colour, size, and method as the agency identification. 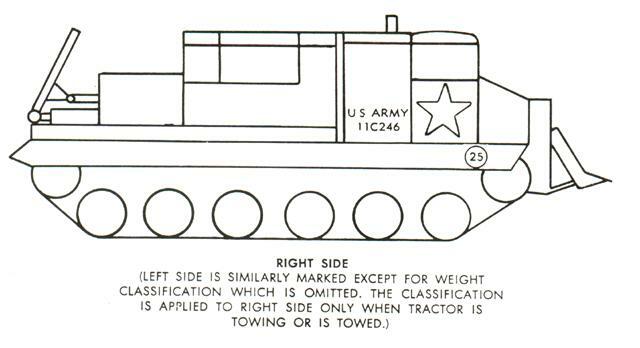 a) These markings will be applied to vehicles and equipment by units to which they are assigned. The markings will be maintained at all times but will be removed when the vehicle or equipment is permanently transferred. b) The unit identification markings will normally appear on both the front and rear of each vehicle, usually on vehicle bumpers when the vehicle is so equipped. 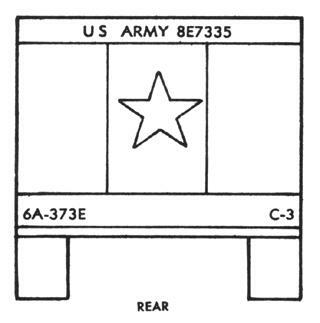 Other suitable surfaces, front and rear, may be used provided the unit identification marking does not conflict with the location and legibility of other markings. 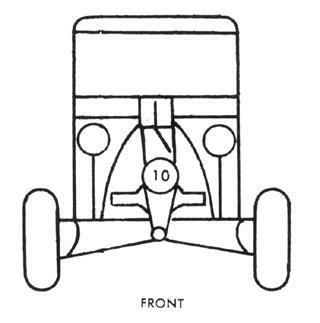 Where no suitable surface is available at the front or rear, the markings will be applied in an appropriate location on each side of the vehicle. 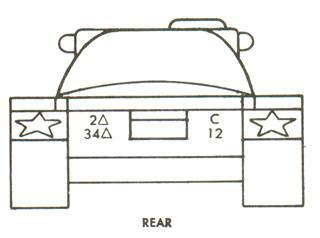 If necessary, the unit identification may be applied to the vehicle mounted equipment. Refer to figures 2 through 8.
c) The markings will be of uniform letters and numerals of the largest size practical to use. They will not exceed the size of the registration number if on the same surface. 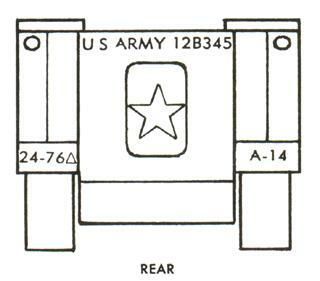 In no case will the unit identification markings exceed 4 inches in height. Symbols used will be approximately the same size and stroke widths as the letter and numeral characters. 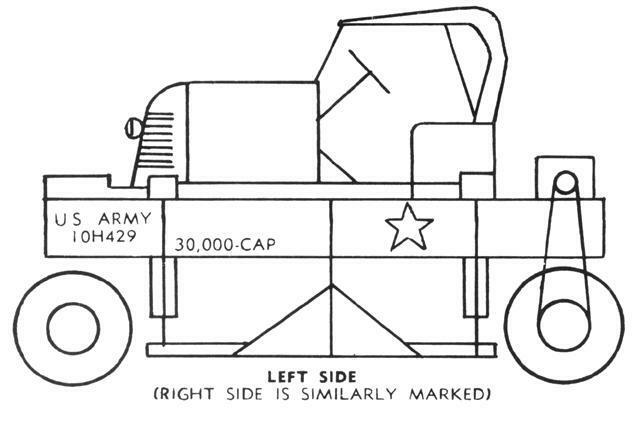 d) The unit identification markings will be applied with a gasoline soluble paint or removable vinyl markings. The markings will be applied in colours as prescribed in paragraph 5e. 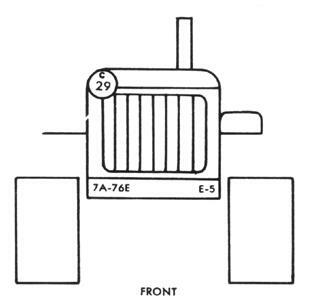 e) Unit identification markings, when painted, will be applied with the use of stencils whenever possible. 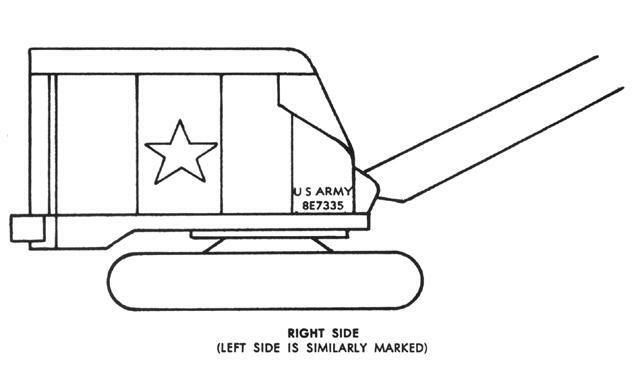 When stencils or removable vinyl decals are not readily available, the markings may be applied free hand with a brush at the discretion of the unit commander. (1) Major command, organisation, activity. (2) Intermediate organisation or activity. (1) Army. The Arabic numeral as assigned, followed by the letter A. (b) Armoured. Equilateral triangle with base down. (4) Brigade. Arabic numeral as assigned, followed by letters BG. (5) Group. Arabic numeral as assigned, followed by letters GP. (6) Continental Army Command. Letters CARC. (7) Army Air Defence Command. Letters AADC. (8) Military District of Washington. Letters MDW. (9) Reception Centre. Letters RC. (10) Replacement Training Centre. Letters RTC, preceded by the applicable branch of service symbol. (11) Training Centre. Letters TC, preceded by the applicable branch of service symbol. (12) U.S. Army Materiel Command. Letters AMC. (13) U.S. Army Supply and Maintenance Command. Letters SMC. 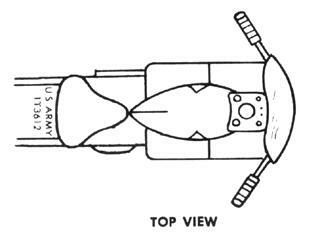 (14) U.S. Army Mobility Command. Letters MOCOM. 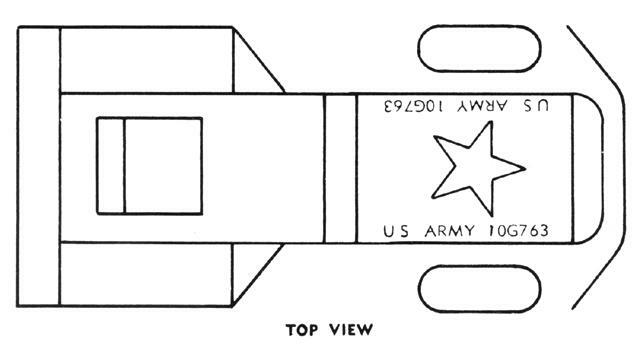 (15) U.S. Army Missile Command. Letters MICOM. (16) U.S. Army Electronics Command. Letters ELC. 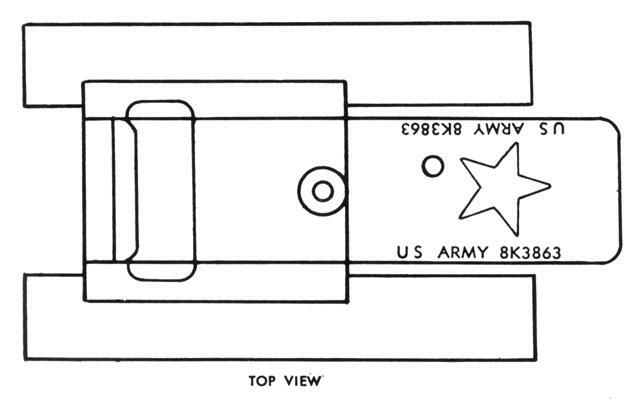 (17) U.S. Army Munitions Command. Letters MUCOM. (18) U.S. Army Weapons Command. Letters WCOM. 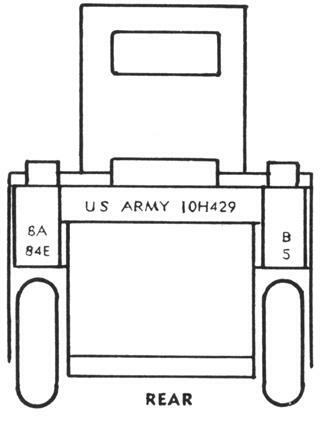 (19) U.S. Army Test and Evaluation Command. Letters TEC. (20) U.S. Army Combat Development Command. Letters CDC. (21) Major Overseas Commands. Appropriate and non-conflicting letters to properly identify the command. (22) Other Major Commands, Organisations, or Activities. Appropriate and non-conflicting letters and where applicable, numerals to properly identify the command, organisation, or activity. (1) Regiment, Battalion, Separate Company or Detachment, or Similar Unit. Arabic numeral as assigned, followed by the applicable branch of service symbol. (d) Armoured. Equilateral triangle with base down. (g) Field Artillery. Letter F.
(h) Infantry. Letter I, to be separated from the numeral by a dash 1/2 inch long. (j) Military Police. 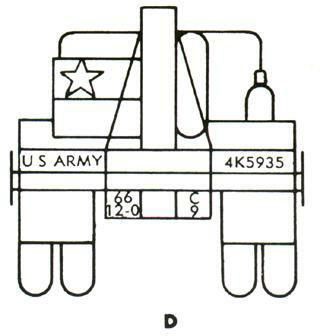 Letter P.
(k) Ordnance. Letter O, to be separated from the numeral by a dash 1/2 inch long. (2) Organisations under the Combat Arms Regimental System (DA Pam 220-1). (a) Battle Group (attached). Arabic numeral as assigned, followed by the letter B and basic identification of the infantry unit. (b) Reconnaissance Squadron. Arabic numeral assigned, followed by the letter R and basic identification of the cavalry unit. (c) Tank Battalion. 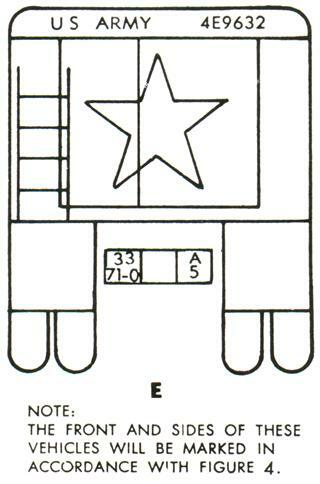 Arabic numeral as assigned, followed by the armoured symbol and basic identification of the armoured unit. (d) Field Artillery Battalion. 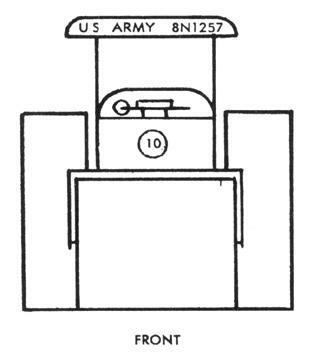 Arabic numeral as assigned, followed by the letter F and basic identification of the field artillery unit. (3) Installation. Appropriate non-conflicting letters, normally not to exceed 3, to identify the installation. (4) Other Intermediate organisation or activity. Appropriate non-conflicting letters and where applicable, numerals, to properly identify the organisation or activity. (5) No intermediate organisation or activity. Letter X. 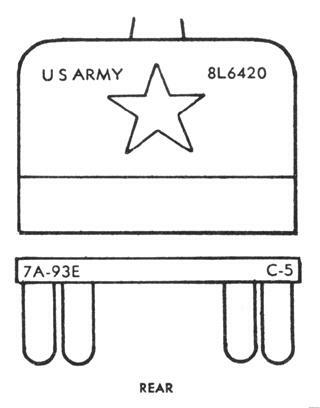 (1) Company, Battery, or Other Company Type Unit. Letters as assigned, or one of the following symbols where applicable. (a) Headquarters and headquarters unit, or headquarters and headquarters service unit. Letters HQ. If the unit is of a battalion not previously identified, the numerical designation of the battalion will precede the letters HQ. (b) Service Unit. Letters SV. When the unit is of a battalion not previously identified, the numerical designation of the battalion will precede the letters SV. (b) Automatic Weapons. Letters AW. (e) Guided Missile. Letters GM. (f) General Support. Letters GS. (g) General Automotive Maintenance. Letters GAS. (h) Heavy Weapons. Letters HW. (j) Direct Support. Letters DS. (m) Parachute Maintenance. Letters PM. (q) Other Name Units. Appropriate and non-conflicting letters, normally not to exceed three, to properly identify the name of the unit. When necessary, the numerical designation of the battalion will precede the applicable symbol. (3) Transportation Motor Pools at installation. Letters TMP. (4) Organisation or activity fully identified in h above. 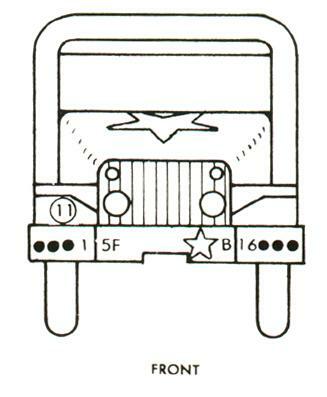 Letter X.
j) The vehicles will be numbered as indicated below. 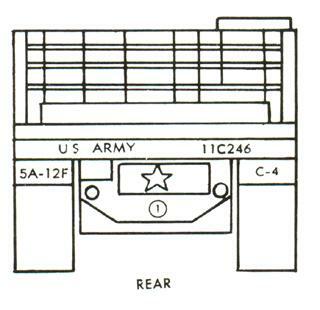 (1) This marking is the sequence number of the vehicle in the normal order to march within the unit to which it is assigned. 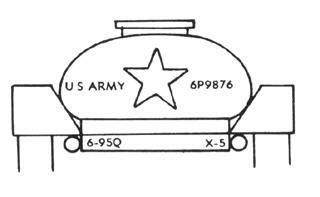 (2) Vehicles assigned to any headquarters will be numbered with the vehicles of the appropriate headquarters unit, and will be given the lower sequence numbers used therein. (3) Vehicles assigned to transportation motor pools may be assigned numbers in any appropriate sequence. (1) 1A-X-HQ-4. 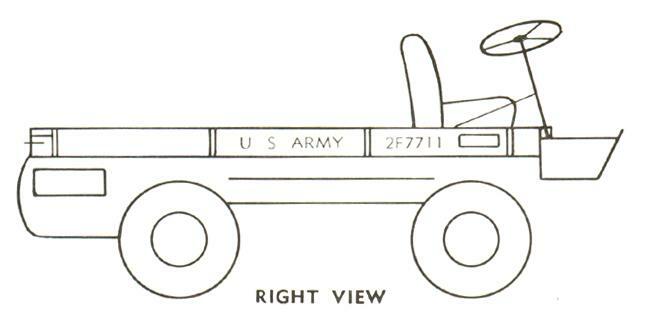 First United States Army, HQ & HQ Co, 4th vehicle. (2) VII-M-X-9. VII Corps, Med Det, 9th vehicle. (3) 25-1B27-C-3. 25th Inf Div, lst Battle GP of 27th Inf, Co C, 3d vehicle. (4) 4-2R8-A-6. 4th Inf Div, 2d Recon Sq of 8th Cav, Trp A, 6th vehicle. (5) 3 -1 -32-B-7. 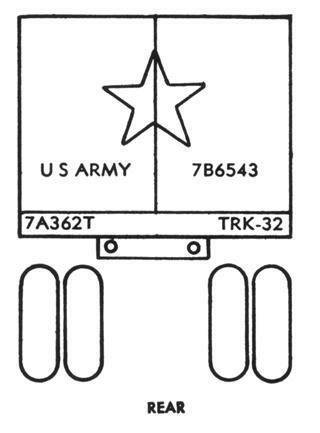 3d Armd Div, lst Tk Bn of 32d Armor, Co B, 7th vehicle. 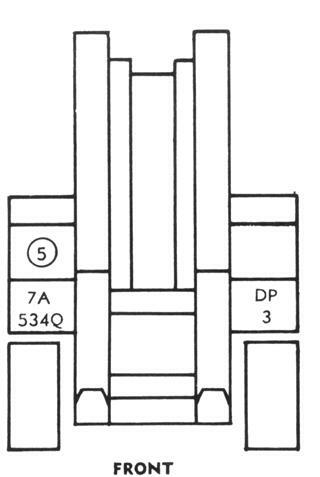 (6) 10-2F7-C-2. 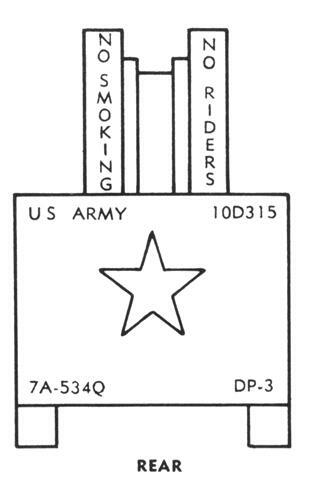 10th Inf Div, 2d Bn of 7th FA, Btry C, 2d vehicle. (7) 82AB-32OF-D-5. 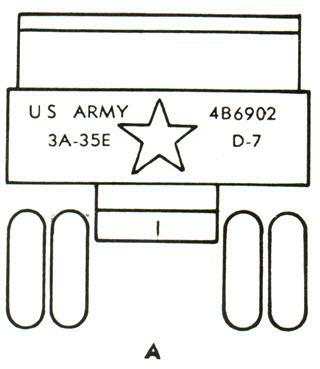 82d Abn Div, 320th FA, Btry D, 5th vehicle. (8) 2 -1-150-A-8. 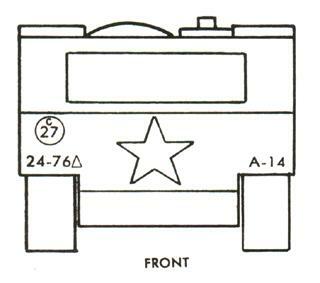 2d Armd Div, lst AR Bn of 50th Inf, Co A, Sth vehicle. (10) 4GP-S-HQ-2. 4th Sig Gp, Hq & Hq Det, 2d vehicle. 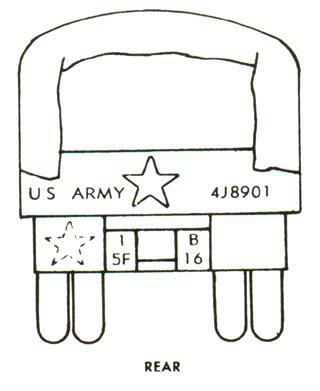 (11) 2A-962-0-AM-5, Second United States Army, 962d Ord Ammo Co, 5th vehicle. (12) 4A-483Q-REF-1. 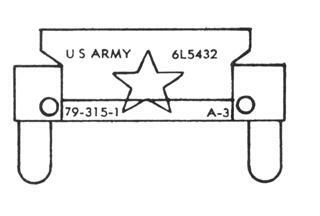 Fourth United States Army, 483d QM Refrigerating Co, lst vehicle. (13) 3A-1M-SUR-10. Third United States Army, lst Surg Hosp, 10th vehicle. 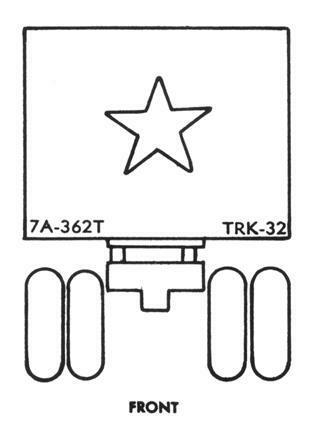 (14) 5A-531T-TRK-7. Fifth United States Army, 531st Trans Trk Co, 7th vehicle. (15) 1AADC-52ADA-3HQ-2. 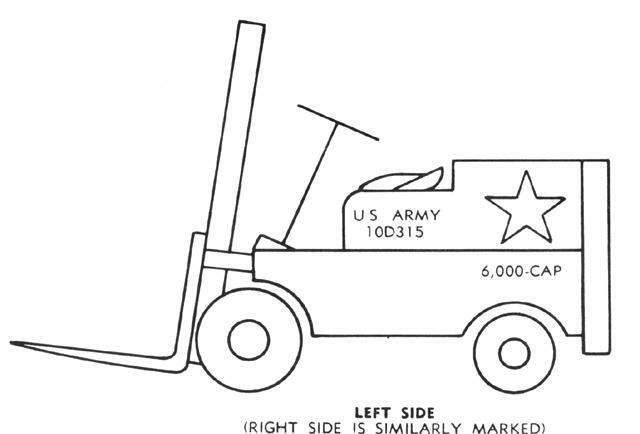 lst Rgn Army Air Def Comd, 52d Air Def Arty Rgt, Hq Btry of 3d Msl Bn, 2d vehicle. (16) TC-FE-TMP-12. Trans Corps, Ft Eustis, Trans Mtr Pool, 12th vehicle. (17) 6A-FO-TMP-9. Sixth United States Army, Ft Ord, Trans Mtr Pool, 9th vehicle. m) When directed on authority from the responsible commander for security purposes the first and second categories listed in paragraph 9f (1) will be completely removed from all vehicles and equipment being shipped with units outside the continental United States. 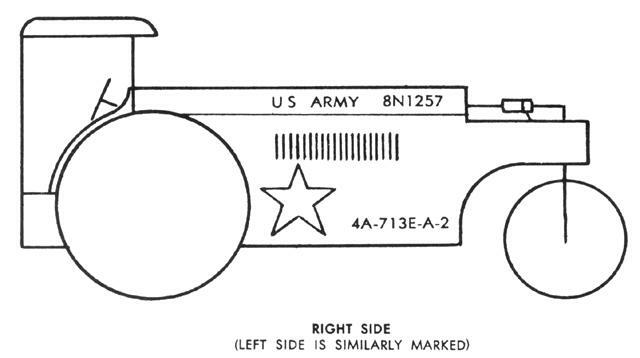 a) Tactical Markings. 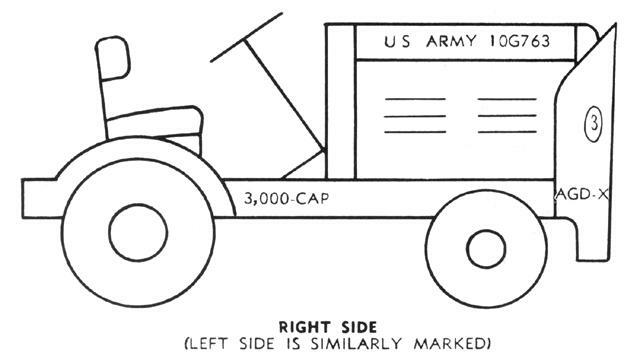 These markings are used to provide a more visible means for identifying vehicles of tactical units by the personnel of those units during tactical operations. Commanders of major organisations are responsible for determination of the type of tactical markings to be used by all units within their organisations, and the location of the markings on the vehicles. Changes may be made only with the approval of the major commanders. 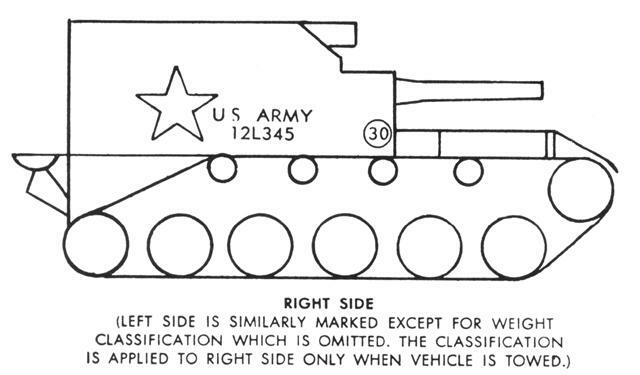 (1) These tactical markings may consist of stripes, geometrical figures, or other simple designs, including names for individual vehicles. (2) The markings will be of suitable size for identification from the ground at reasonable distances, and may be applied in any appropriate colour using gasoline soluble paint or removable vinyl markings. 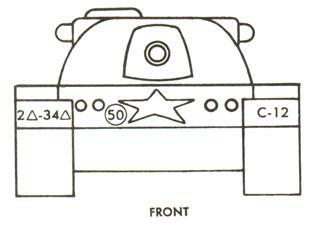 (3) Tactical markings should be designed to be as nearly unintelligible to enemy observation as possible. The markings will not, in any way, represent or suggest the numerical designation or distinctive insignia of any unit. No written record will be made or published describing the system of markings used. b) Priority Sign. This is a sign to mark those vehicles which are assigned priority of movement over all other vehicles in an area by the responsible area commander. 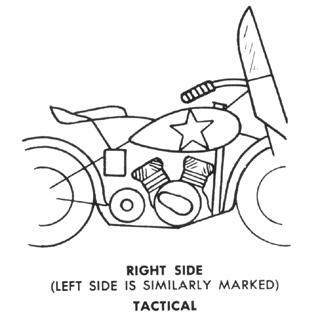 These markings may be authorised for any significant and essential reason and are valid only within the area under the jurisdiction of the responsible commander. They must be removed when no longer required for the priority mission; they may not be displayed when the vehicle is not actually on a priority mission. (1) The priority sign will be made of sheet metal in the shape of an equilateral triangle with one point down. Each side will be 12 inches long; the corners will be rounded to a 1/2 inch radius. 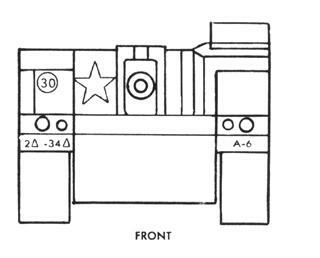 Refer to figure 9. (2) The background colour will be lusterless white, Colour Chip No. 37875. A 1 inch wide border will be lusterless red, Colour Chip No. 31136. 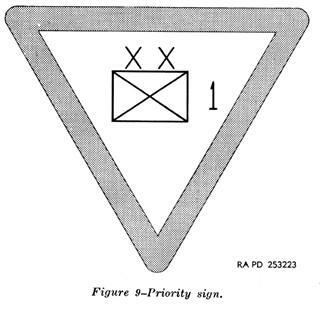 The military symbol of the organisation whose commander authorised the priority will be centred in the triangle. Colour of the symbol will be lusterless red, Colour Chip No. 31136. (3) All symbols used will conform to FM 21-30.
a) The national symbol is a 5-pointed star of lusterless white, Colour Chip No. 37875. It will be applied to all tactical and combat vehicles and appropriate equipment in CONUS and overseas. 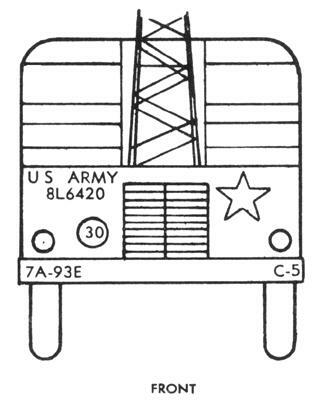 The symbol will be applied to vehicles and equipment only when withdrawn for issue to U.S. Army units. It will not be applied to ambulances or other medical service vehicles affected by international agreement concerning such vehicles. 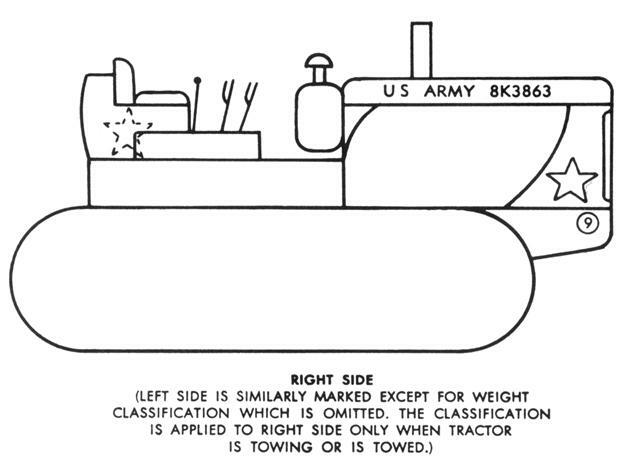 b) The marking will normally be applied to the front, rear, both sides, and top of the vehicle. 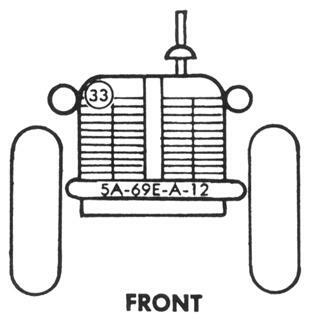 The symbol may be applied to mounted equipment on vehicles when such equipment provides the most suitable surfaces. It will not normally be applied to canvas surfaces. c) The National Symbol marking will be located on the largest regular area and as near as possible to the centre of such area. It will not be applied in a location where it will, in normal usage, be obscured by paulins, canvas doors, folded-down windshields, gasoline cans, communications equipment, or other such items. (1) Roof of vehicles with hard roof bodies. (2) Top of cab on vehicles with hard roof cabs but not having hard roof bodies. (3) Top of hood when no other suitable hard surface of adequate size is available. 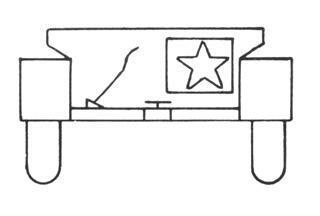 e) On horizontal surfaces the star will be applied with one point directly toward the front of the vehicle or equipment. On vertical surfaces the star will have one point directly up. 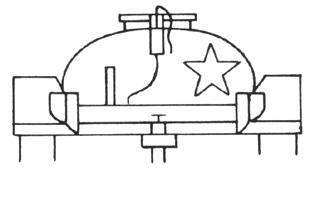 f) The star will be applied in either of the two methods of permanent marking, stencilled-paint or pressure sensitive adhesive vinyl. Vinyl markings will not be used on highly irregular or rough surfaces where adhesion would not be complete. 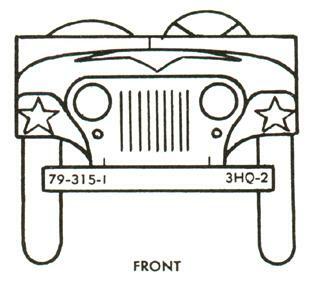 National Symbol markings at different locations on any one vehicle or piece of equipment may be applied in different methods. g) The National Symbol will be the largest size practical for use in the available space, but will not exceed 36 inches measured between opposite points. 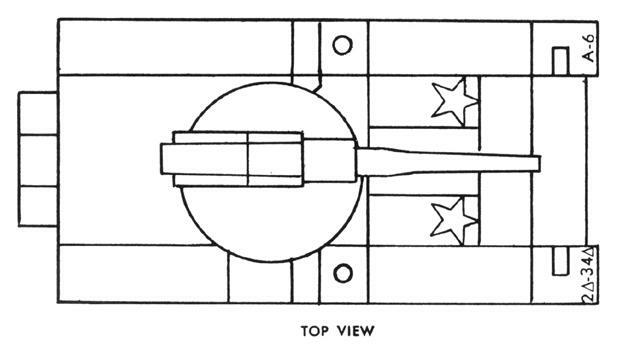 The star will not be applied in sizes less than 6 inches between opposite points. 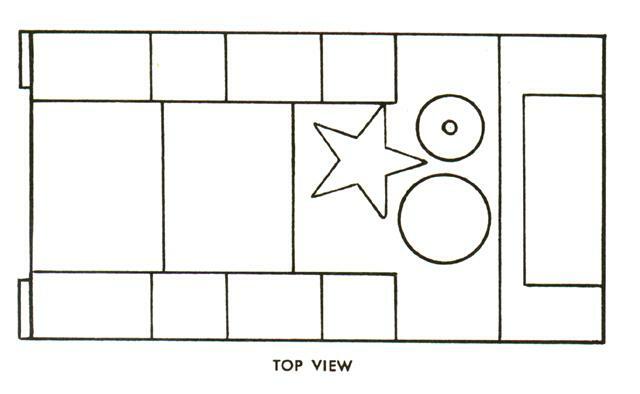 h) See table A, appendix 1, for recommended sizes and locations.